In the past 10 years, BCTGM locals in Eastern Canada have suffered significant membership losses. In 2007, the Hershey Company closed the iconic Moir's bakery in Halifax, Nova Scotia and moved production to a facility in Mexico. More than 550 BCTGM Local 446 (Halifax) members lost their jobs. In 2015, more than 100 members of Local 446 were laid off when Canada Bread closed its Halifax bakery. Subsequently, Local 446 merged with Local 406 in Moncton, New Brunswick in 2016. In the last 10 years, BCTGM locals in Eastern Canada have suffered significant membership losses. In 2007, the Hershey Company closed the iconic Moir’s bakery in Halifax, Nova Scotia and moved production to a facility in Mexico. More than 550 BCTGM Local 446 (Halifax) members lost their jobs. In 2015, more than 100 members of Local 446 were laid off when Canada Bread closed its Halifax bakery. Subsequently, Local 446 merged with Local 406 in Moncton, New Brunswick in2016. Meanwhile, Local 406 has not been immune to the same challenges. 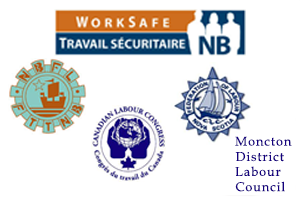 Hundreds of union members were lost when Canada Bread closed bakeries in Moncton and Grand Falls, while also eliminating sales route drivers and making them independent operators. According to BCTGM International Canadian Vice President Ron Piercey, the only way to confront such membership losses is to organize. “There are thousands of non-union workers in Eastern Canada who want to belong to a union. In fact, Stewards discuss different strategies for talking to workers at nonunionworkplaces. Intl. Dir. Research/Education Matthew Clark and L. 406 Officers particpated in a rally supporting Sackville, N.B. public sector workers. Protesters stormed the town council meeting at the Sackville City Hall and demanded city officials bargain fairly with its unionized workers. 6 BCTGM News many of these workers are friends or family of our very own members. So, it is our job to reach out to them, educatethem on the benefits of belonging to the BCTGM as well as the larger labor movement, and organize them into our union,” said Piercey. In an effort to assist the Eastern Canadian locals in rebuilding their membership through organizing, the International Union conducted a comprehensive organizing program in April. More than 35 stewards from New Brunswick, Nova Scotia and Newfoundland participated in the intensive two-day program that focused on teaching stewards and rankand-file union members how to organize. As part of the International’s education efforts, Clark accompanied the local union leadership on site visits to nonunion targets, helped create an organizing target database, and networked with other Canadian worker organizations in the region. According to BCTGM International Director of Organization John Price, the International Union will be doing similar programs throughout North America in an effort to encourage more grassroots organizing. “Our local unions want to help organize and many have embraced the challenge. They want to be part of a rejuvenated labor movement that will help working families across North America,” concludes Price.